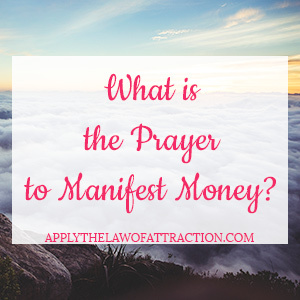 Home » Law of Attraction for Money » What is the Prayer to Manifest Money? 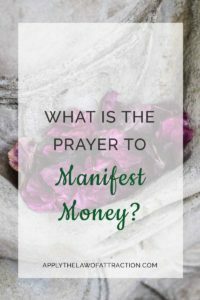 Have you been asking, “What is the prayer to manifest money?” Well, you’ve come to the right place. I have two prayers for money that have been shown to work time and time again. The first is a huna prayer for money that was created by Dywhal Khul. Dywhal recommended that you say the prayer once a day for 30 days to open yourself up to abundance. We hereby ask and humbly pray with all our hearts, souls, minds and might for divine abundance made manifest through personal fortune and success. We are willing to move beyond fear in order to fulfill God’s plan on Earth and beyond. I personally pledge to open myself to financial wealth in order to fulfill my group and individual service commitments. In God’s name, we accept our divine heritage right now and thank thee for the timely answers to this prayer. The second prayer is actually an abundance mantra. It can be used for health, wealth or happiness. You should chant this mantra to the Lakshmi, the Hindu goddess of good fortune and prosperity…108 times a day for 40 days. Chanting it 108 times sounds like a lot, but there is a reason for this specific number. It would take forever for me to tell you, and would involve a lot of math equations… so just trust that there’s a good reason. Have fun with these two prayers. I’d love to hear about your experiences with them! It’s Time to Be Rich! o my god! really i was searching for the money mantra and the God lakshimee to come in my home and stay with me for ever. I got today! Thank you very much whoever has sent me this for remember and do say and beleive and receive. Thank you very much once more. Waiting for more and more money mantra and advice from you. You’re welcome Chandra! How wonderful that the God Lakshimee and the money mantra came to you in the perfect timing! I’m sure money is on it’s way to you and will arrive at just the right time too. I thank God for these teachings and I believe am in great abundance of money and riches now in Jesus Christ name, amen. Hi Elizabeth, I tried to send you a thank you email from your last response but my email kept bouncing back so I just wanted to let you know that I’m always grateful to you and your responses. I was wondering if you think that chanting this mantra could also help me in situation with my guy? Hi Claudia, I’m glad I could help. This mantra is specifically for money. It would not apply to your situation.